Sue is pleased that more cats are finding homes just now – Diesel & Buffalo Bill were both happily homed this week. Sue is looking forward to taking a family of 5 ferals to a farm at Callander on the west coast – the people are busy making a pen for them to live in if they choose, or they have the option of living in the house! Linda Naismith will be decorating the Newburgh shop Christmas window on Wednesday next week – featuring Christmas Gifts – if you have any unwanted gifts they would be much appreciated. She also still needs red material of you have any to spare. 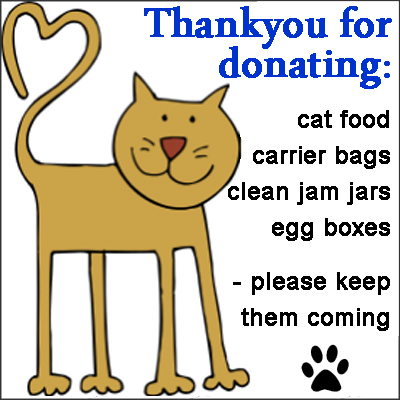 Thanks go to everyone who has donated cat food & clean jam jars.